Abbott and Costello Meet Frankenstein[a] is a 1948 American horror comedy film directed by Charles Barton and starring the comedy team of Abbott and Costello. The picture is the first of several films in which the comedy duo meets classic characters from Universal's horror film stable. In this film, they encounter Count Dracula (Bela Lugosi), Frankenstein's monster (Glenn Strange), and the Wolf Man (Lon Chaney Jr.). Subsequent films pair the duo with the Invisible Man, Dr. Jekyll and Mr. Hyde, and the Mummy. (The comedians interacted with the last of the Universal Studios monsters, the Creature from the Black Lagoon, on live television on the Colgate Comedy Hour in 1954.) This film is considered the swan song for the "Big Three" Universal horror monsters, none of whom had appeared in a Universal film since House of Dracula (1945). In 2001, the United States Library of Congress deemed this film "culturally, historically, or aesthetically significant" and selected it for preservation in the National Film Registry, and in September 2007, Reader's Digest selected the movie as one of the top 100 funniest films of all time. The film is number 56th on the list of the American Film Institute's "100 Funniest American Movies". Lawrence Talbot (Lon Chaney Jr.) makes an urgent phone call from London to a Florida railway station where Chick Young (Bud Abbott) and Wilbur Grey (Lou Costello) work as baggage clerks. Talbot tries to impart to Wilbur the danger of a shipment due to arrive for "McDougal's House Of Horrors", a local wax museum. The crates purportedly contain the remains of Count Dracula (Béla Lugosi) and the Frankenstein monster (Glenn Strange). However, before Wilbur can understand, a full moon rises and Talbot transforms into a werewolf. He proceeds to destroy his hotel room while Wilbur is on the line. Wilbur thinks the call is a prank and hangs up. Meanwhile, the museum owner, McDougal (Frank Ferguson), has arrived to claim the shipments. When Wilbur badly mishandles the crates, McDougal demands that the boys deliver them to his museum so his insurance agent can inspect them. Chick and Wilbur deliver the crates after hours. They open the first one and find Dracula's coffin. When Chick leaves the room to retrieve the second crate, Wilbur reads aloud the Dracula legend printed on an exhibit card. The coffin slowly creaks open. Wilbur is so frightened that his attempts to call Chick result in helpless sputtering. Before Chick returns with the second crate, Dracula climbs unnoticed out of his coffin and hides in the shadows. Wilbur claims that the coffin opened, but Chick shows him that it is in fact empty. While the boys open the second crate containing the Monster, Chick leaves the room to greet McDougal and the insurance agent. Dracula now hypnotizes Wilbur and reanimates the Monster. They both leave and by the time McDougal, the insurance agent, and Chick enter, both crates are empty. McDougal accuses the boys of theft and has them arrested. That night, Dr. Sandra Mornay (Lenore Aubert) welcomes Dracula and the Monster to her island castle. Sandra, a gifted surgeon who has studied Dr. Frankenstein's notebooks, has seduced Wilbur as part of Dracula's plan to replace the Monster's brutish brain with a more pliable one—Wilbur's. Wilbur and Chick are bailed out of jail. They assume that Sandra posted bond, but Joan Raymond (Jane Randolph), an undercover investigator for the insurance company, did so. Joan also feigns love for Wilbur, hoping that he will lead her to the missing "exhibits". Wilbur invites Joan to a masquerade ball that evening. Meanwhile, Lawrence Talbot has tracked Dracula and the Monster from Europe and has taken the apartment across the hall from Wilbur and Chick. Talbot asks Chick and Wilbur to help him find and destroy Dracula and the Monster. Wilbur believes, but Chick remains skeptical. That night Wilbur, Chick and Joan go to Sandra's castle to pick her up for the ball. Wilbur answers a telephone call from Talbot, who informs them that they are in fact in the "House of Dracula". Wilbur reluctantly agrees to search the castle with Chick and soon stumbles upon a basement staircase that leads to a boat and dock. Chick insists they search for Dracula and the Monster to prove to Wilbur that they do not really exist. Behind a revolving door, Wilbur experiences a few close calls with the monsters; whenever he tries to get Chick's attention, the monsters have disappeared. Meanwhile, Joan discovers Dr. Frankenstein's notebook in Sandra's desk and Sandra finds Joan's insurance company employee ID in her purse. As the men and women prepare to leave for the ball, a suavely dressed Dr. Lahos (a.k.a. Dracula) introduces himself to Joan and the boys. Also working at the castle is the naive Prof. Stevens (Charles Bradstreet), who questions some of the specialized equipment that has arrived. After Wilbur admits that he was in the basement, Sandra feigns a headache and tells Wilbur and the others that they will have to go to the ball without her. In private, Sandra admits to Dracula that Stevens' suspicions, Joan's credentials, and Wilbur's snooping in the basement have made her nervous enough to put the experiment on hold. Dracula asserts his will by hypnotizing her and biting her in the neck (in a continuity error, Dracula's reflection is visible in a mirror. Vampires do not have reflections, as stated in Dracula (1931)). Everyone is now at the masquerade ball. Talbot arrives and confronts Dr. Lahos, who is in costume as Dracula. Lejos easily deflects Talbot's accusations and takes Joan to the dance floor. Sandra lures Wilbur to a quiet spot in the woods and attempts to bite him, but Chick and Larry approach and she flees. While Talbot, Chick and Wilbur search for Joan, Talbot transforms into the Wolf Man and stalks Wilbur. Wilbur escapes, but the Wolf Man attacks McDougal, who is also at the ball. Since Chick's costume includes a wolf mask, McDougal accuses Chick of attacking him out of revenge. Chick escapes and witnesses Dracula hypnotizing Wilbur. Chick is also hypnotized and rendered helpless, while Dracula and Sandra bring Wilbur and Joan back to the castle. The next morning, Chick and Talbot, both fugitives, meet up in the bayou. Talbot confesses to Chick that he is indeed the Wolf Man. Chick explains that Dracula has taken Wilbur and Joan to the island and they agree to work together to rescue them. Wilbur is held in a pillory in the cellar. Sandra explains her plan to transplant his brain into the Monster. When she and Dracula leave him to prepare the Monster for the operation, Chick and Talbot sneak in to set Wilbur and Stevens free. Dracula and Sandra return to the cellar and find Wilbur missing; Dracula easily recalls Wilbur and he soon finds himself strapped to an operating table in the lab. The Monster is on an adjacent table, receiving electric shocks. As Sandra brings a scalpel to Wilbur's forehead, Talbot and Chick burst in. Talbot pulls Sandra away from Wilbur and Chick unintentionally knocks her out while fending off Dracula with a chair. Chick flees the lab, pursued by Dracula. Talbot is about to untie Wilbur when he once again transforms into the Wolf Man. Dracula returns to the lab and engages in a brief tug of war with the Wolf Man over Wilbur's gurney. Dracula flees and the Wolf Man gives chase. Chick returns to untie Wilbur just as the Monster, now at full power, breaks his restraints and climbs off his gurney. Sandra attempts to command him, but the Monster picks her up and tosses her out the lab window to her death. Chick and Wilbur escape the lab and run from room to room with the Monster following them. Dracula, while fighting with the Wolf Man, attempts to escape by transforming into a bat. The Wolf Man leaps, catches the bat and tumbles off a balcony onto the rocks below. Presumably, both are killed. Joan abruptly wakes from her trance and is rescued by Stevens. The boys run out of the castle to the pier, with the Monster still in pursuit. They climb into a small rowboat, while Stevens and Joan arrive and set the pier ablaze. The Monster wheels around into the flames, succumbing as the pier collapses into the water. Wilbur scolds Chick for not believing him. Chick insists that now that all of the monsters are dead, "there's nobody to frighten us anymore." They suddenly hear a disembodied voice (provided by an uncredited Vincent Price) and see a cigarette floating in the air. The voice says, "Oh, that's too bad. I was hoping to get in on the excitement. Allow me to introduce myself—I'm the Invisible Man!" The boys jump out of the boat and swim away while the Invisible Man laughs. The film was originally titled The Brain of Frankenstein, but the title was changed during filming to appear like less of a straight horror film and capitalize on Abbott and Costello's marquee value. In a 1996 documentary, 100 Years of Horror, hosted by Christopher Lee, Bela G. Lugosi, Jr. states that the studio hired additional comedians to add laughs between takes on the set. This is incorrect; one comedian, Bobby Barber, sufficed. Costello hated the script. He said that his five-year-old daughter could have written something better, but later warmed to the film during production. During filming, Glenn Strange found Costello so funny he would often break up laughing, necessitating many retakes (this is readily apparent in the scene where Costello sits on the Monster's lap). There were several pie fights and other horseplay between takes as well, but Abbott and Costello respected the three monsters and made sure no pies or seltzer hit the heavily made-up actors. No indication has been found suggesting Boris Karloff was ever approached to appear in this film, although he did help promote the film and can be seen in several publicity photos, including one where he points at a poster outside a New York theater. His alleged comment ("As long as I don't have to see it!") has been used to imply he either disliked Abbott and Costello, or was aghast at playing the Monster for laughs. In fact, he had done the latter a year before in The Secret Life of Walter Mitty, though the segment was excised. And Karloff appeared with the duo in Abbott and Costello Meet the Killer, Boris Karloff (1949), and in Abbott and Costello Meet Dr. Jekyll and Mr. Hyde (1953). When the Monster throws Sandra through the lab window, Glenn Strange stepped on a camera cable and fractured his ankle. Lon Chaney Jr., who had previously played the Monster in The Ghost of Frankenstein, took over the role of the Monster for that brief scene. A stuntman doubled for Strange in some long shots of the fire scenes on the pier. The Australian film board deleted almost every scene involving a monster before the film could be approved for release in that country. This was the only time on film Béla Lugosi officially reprised the role he had created in Dracula (1931). He had previously portrayed vampires or similar caped characters in Mark of the Vampire (1935), Spooks Run Wild (1941), The Return of the Vampire (1943) and Scared to Death (1947) and would do so again in Mother Riley Meets the Vampire (1952) and Plan 9 from Outer Space (1959), as well as a gag cameo as a wax figure of himself as Dracula in a 1933 Hollywood on Parade short, but this was the only other time he played Dracula as a sustained role. Abbott and Costello sidekick Bobby Barber appears in the film as a waiter at the costume ball. Barber was a regular part of the crew of many Abbott and Costello productions. Deleted and backstage footage from the movie catches Costello and Barber in several gags and stunts. The final scene with the Invisible Man presaged Abbott and Costello Meet the Invisible Man (1951), though Price did not star and all characters were different. However, Vincent Price had appeared in The Invisible Man Returns (1940). This was the fourth Universal film to include Dracula assuming an alias, "Dr. Lahos." The character masquerades as "Count Alucard" in Son of Dracula and as "Baron Latos" in House of Frankenstein and House of Dracula. The film was originally budgeted at $759,524 but went $32,746 over. Abbott and Costello were paid $105,000. After being released several times on VHS in the 1980s and 1990s, the film was released four times on DVD. Originally released as a single DVD on August 29, 2000, it was re-released twice as part of two different Abbott and Costello collections, The Best of Abbott and Costello Volume Three, on August 3, 2004, and again on October 28, 2008 as part of Abbott and Costello: The Complete Universal Pictures Collection. The film's Blu-ray debut and DVD re-release was on September 4, 2012 as part of Universal's 100th Anniversary series. It was also included in Frankenstein: Complete Legacy Collection (2014) along with seven other Universal Frankenstein films. Because this movie includes characters and people featured in their own collections, it is part of the legacy collections of "Frankenstein", "Dracula", "The Wolf Man", and "The Best of Abbott and Costello". It was released again on Blu-ray, as a stand-alone title, on October 14, 2014. According to Variety the film earned $2.2 million in rentals in the US in 1948. On Rotten Tomatoes, the film holds an approval rating of 88% based on 25 reviews, with a weighted average rating of 7.1/10. The site's critical consensus reads, "A zany horror spoof that plays up and then plays into the best of Universal horror cliches." In 2000, the American Film Institute placed the film on its 100 Years...100 Laughs list, where it was ranked No. 56. ^ The film's poster title reads Bud Abbott and Lou Costello Meet Frankenstein, while the onscreen title is Bud Abbott Lou Costello Meet Frankenstein. 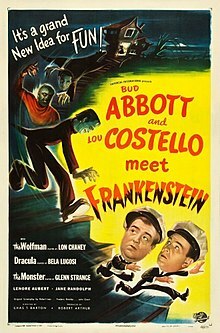 ^ "Abbott and Costello Meet Frankenstein (1948) - Rotten Tomatoes". Rotten Tomatoes.com. Flixer. Retrieved 12 June 2018. ^ "AFI's 100 Years...100 Laughs" (PDF). American Film Institute. Retrieved August 28, 2016. Wikimedia Commons has media related to Abbott and Costello Meet Frankenstein. This page was last edited on 5 February 2019, at 10:00 (UTC).